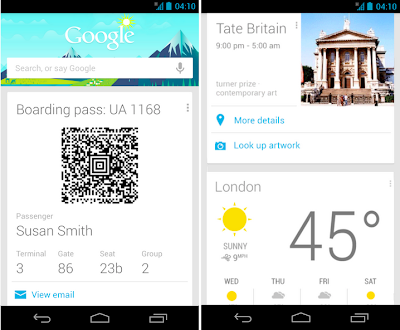 As you head off this holiday season, the latest update to Google Now makes it even more useful for traveling. Before you even leave your house, Google Now will tell you what the weather will be like at your destination (just in time to make sure you remember to pack those mittens). At the airport, your boarding pass is automatically pulled up, helping you breeze through to the gate (launching shortly for United Airlines, with more to come). And once you've arrived at your destination, Google Now can help you uncover some great activities, by showing you events happening around you, suggesting websites for you to explore as you research things to do, or allowing you to learn more about specific pieces while you’re at a museum (using Google Goggles). All of this builds on top of some of the other cards designed for travel, like the currency conversion, translation, and flight status cards -- hopefully taking a little bit of the stress out of holiday travel so you can focus on family and fun. We're also making Voice Search even more powerful: you can find out the name of the song that’s playing (“What’s this song?”), quickly find product info (“Scan this barcode”) and post updates to Google+ simply by using just your voice. These goodies are waiting for you in the updated Google Search app, available on Google Play for devices running Android 4.1, Jelly Bean, or higher. Now Dasher! Now Dancer! Now, Prancer and Vixen! On, Comet! On, Cupid! On, Donner and Blitzen! 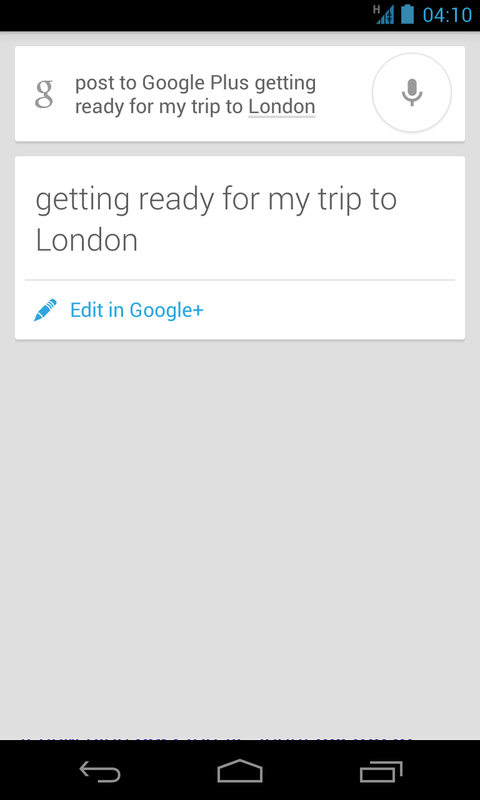 For Santa’s holiday travel this season, Google Now is just the prescription. How about making it possible to use for people who don't have English as the main language on their Android phone? I'm not talking about the voice language, even if I set it to English, it doesn't work because my Android main language is Swedish. That makes no sense. Posting to twitter and Facebook would be great in the future too. Loving Google now so far! The travel features are pretty much useless currently, as about 0,01% of users have a roaming data plan (at least in Europe).